Why goats and not any other animals? Research shows that local goat breeds are the easiest and cheapest domestic animals to raise in Uganda. They are disease-resistant and will feed on practically any local vegetation, at no additional cost to the woman. Since most of our beneficiaries are very poor women, we don’t want them to have to spend a lot of effort and money into caring for their animals. The startup cost for a goat (beyond the purchase of the goat itself) is a piece of string and some de-worming tablets. By way of example, the startup cost for rabbits(beyond the cost of the animal itself) can be $150/family for special food and cage materials (wood/wire) that must be purchased at market. The low startup cost for the goat program allows for exponential growth of the program within the center without requiring additional fundraising efforts. Finally, the economic advantage of 5 goats is substantial in Uganda. It equates to roughly 116% of the woman's annual income. This relatively large funding can be used to strategically change the course of her family's economic stability. Why do you give goats to women only, and not men? In Uganda, women as a whole are more disadvantaged than men. In rural Uganda especially, women literally own nothing but their own names. This forces women to be completely dependent on men, even in abusive relationships. When her husband dies, a woman might be subject to wife inheritance (a widow is inherited by a man from her deceased husband’s family) or lose all that she accumulated when her husband was alive, and be forced to return back to her family empty-handed. Giving goats to women to own empowers them to take better charge of their lives and destinies, and increases their bargaining power with men. Second, women have proved to be more reliable in abiding by the policies of projects such as this. They more easily see and appreciate the potential of the project. Third, women share their success with their children. A woman will ultimately use the goats to better the lives of her entire family, making the handing of goats to women a more practical option for the Project. Are you a real organization? The Goat Project Uganda is a legal organization, founded in January 2013 when it began operations in Uganda, and was legally registered in September 2016 as a company limited by guarantee without share capital, in the name of Give A Goat Ltd. We have existed for only a little over 5 years, but the results we have achieved compare to and even surpass those of many other older organizations in Uganda with similar goals, despite our limited resources. We are now partnered with The Framers Project, a 501c3 charity in Ashburn, Virginia, for fundraising and development. Why do you give local goat breeds, as opposed to exotic or crossbred goats? Exotic and crossbred goats are delicate and require more expertise and costs, including administering regular medications. Local goat breeds are disease-resistant and only very rarely will require veterinary services (and even so, the costs would be cheaper). Second, local goat breeds are very ease to feed, as they eat vegetation found locally. Third, rearing of local goat breeds is done everywhere in Uganda -- it’s just usually done by men. Most beneficiaries will therefore already have some experience raising local goat breeds. In Uganda, women already shoulder most of the responsibility in caring for families (such as farming, caring for children, caring for the elderly, cooking, cleaning, and a host of other expected duties). We want the Project to empower and assist them, not provide an additional burden. Are your goats reared to produce milk? Local goat breeds are reared for meat only. The local goats are very small in size, and only produce on average a pint of milk per day. Also, goat milk, despite its tremendous nutritional value, is not popular in Uganda. In some places, it is even considered taboo to drink it. Only a few goat farmers rear exotic or crossbred goats for milk. While we do provide information about milking goats, it is not a goal of this program. Will goats degrade the environment? Goats have been reared in Uganda for centuries and never posed a threat to the environment. Like many parts of Africa, Uganda is experiencing environmental degradation not because of animal rearing, but due to people encroaching on forests and swamps to create space for human settlement and farming, poor farming practices that lead to soil erosion, charcoal and wood burning for fuel, and etc. Goats do not pose a problem. There were once over 2million goats in northern Uganda. Their numbers were decimated by the rebels and war activities of the last 3 decades. Our goal of 10,000 eventual goats is small in comparison, and seeks to re-establish the economic benefit of goats that once populated that area. Additionally, ruminants such as goats, benefit the environment with their processing of tough plant fibers into manure for the soil. The women collect the goat manure and use it to fertilize their gardens and banana plants. How much is needed to start a center? Starting a new center requires 10-20 goats. Each goat costs 80 GBP or $85 USD. Fewer than 10 goats does not make a center viable in terms of administrative costs and the total impact on a community. As each beneficiary contributes 2 goats back to the program, we will see centers grow from 10 -> 20 -> 40 -> 80 goats. Within 7-9 years, each center should have 100 beneficiaries. If you would like to contribute a center in the name of your group, or in memory of a special person, please let us know. We can attribute that center to your cause. Funding for a center is $850 USD for 10 goats. Eventually that center will reach over 100 beneficiaries while requiring no extra funding. Do 100% of donations reach the beneficiaries? On average, 60% of the donation for one goat goes directly into buying, vaccinating, and delivering a she-goat to a beneficiary. 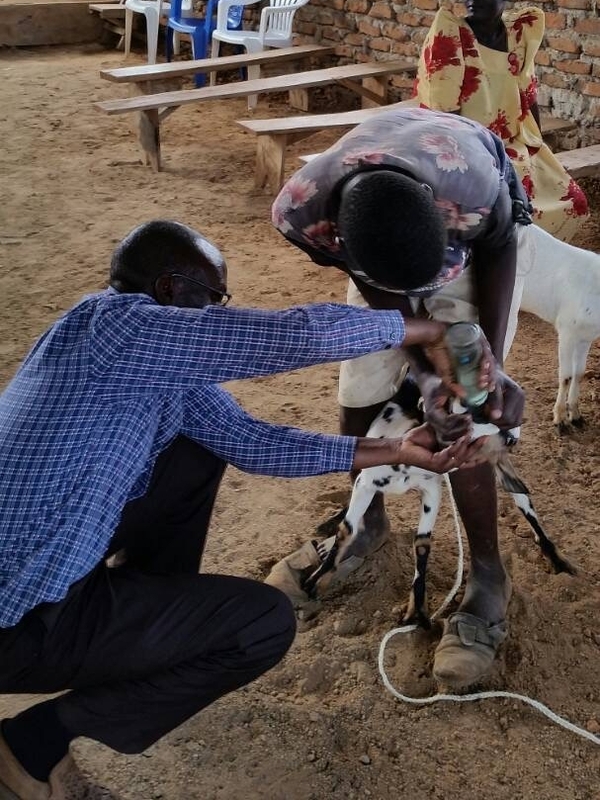 20% of the donation is used for ongoing de-worming, mentoring, and health-monitoring of the goat. The balance is spent on administrative costs of working with the beneficiary over approximately 3 years, until she has 5+2 goats. However, one donation for a goat will end up enabling 14 additional beneficiaries over the course of the next 8-10 years. So in effect, donation for one woman actually gives goats to 15 or more women over a 10 year period -- the gift will keep on giving. Can I keep track of my beneficiary’s progress/success? When you donate a goat, we will take a picture of your beneficiary as she receives your goats, and the goat will be named after you. Additionally, you can check our News/Updates page for more information on the Project in Uganda. We hope in future to be able to bring ongoing updates to donors, but we are limited at this time in our resources. What is the long-term success rate of this project? The self-sustaining quality of the program ensures that the project will keep running for as long as the community wants it to. We partner tightly with the local community, usually through their local church. This ensures an ongoing oversight and reduces chances of misuse of the goat program. The Goat Project Uganda manages the program in a community for about 10 years and then hands it over to a local church to run for as long as the community needs it. Thus, the project could theoretically run forever. How do you choose a community to establish the project in? Most of the time, a community leader (often a church leader) gets wind of the project and requests a center for their community. We meet with that leader and examine their request, looking for both economic need (not hard to find) and ability to support the program well (community involvement + access to free grassland). If the request is approved, a center is opened. Approval is given if the church leader agrees to become the local overseer of the Project in their community and abide by all policies. In a few cases, the Project identifies a community who could use the project and reaches out to the leaders to see if they’d like to participate in the Project. If they consent, a center is opened. Do you discriminate based on religion, since you work with churches? While the Project was founded by Christians and operates on Christian values, beneficiaries are not chosen based on religious affiliation, but rather on whether they can abide by the Project’s policies. Churches are used as meeting points first because they’re ubiquitous, and in most areas already serve as meeting points for communities. Church leaders are already respected in their communities, and both eager and capable to lead the Project, given that they’re already respected and knowledgeable about their communities. We are open to discussing the program with leaders of any religion. We do not attempt to convert anyone from their own religion to another. Do beneficiaries receive sufficient training in goat-rearing? Most beneficiaries already know how to rear goats, since it’s a widespread practice in Uganda -- it’s just usually men who rear goats. However, we add to the knowledge they already have by engaging local government veterinary extension works to train them and be on hand to help the beneficiaries. We provide initial guidance and give them a goat-rearing document (usually one or two women are literate and can help the group). We also ask them to establish a monthly meeting for the women to gather and share best practices. What is the rationale of granting a beneficiary full control of their goats only after they’ve bred to 5 goats (plus donated 2)? Peter had previously worked in Geneva Global’s goat-distributing program, and he found out that the effect of that project was minimal because beneficiaries had a short-term view of their gift. They did not take good care of their goats or sold/ate them soon after receiving them. While selling, killing, or giving away the goats may have reaped short-term benefits, it did nothing to improve their economic status in the long run. This scenario has happened repeatedly in similar programs. Our program is unique. The goal of five goats is, in effect, a "forced savings program". It was created to ensure that the program actually changes the economic status of the beneficiary, and helps entire communities. 5 goats is equivalent to approximately 116% of a woman's annual income. It makes a significant difference to get this much money all at once. Moreover, the discipline cultivated by having to wait 18-36 months to own goats is good for the beneficiary. She learns that she can keep 2-3 goats and continue to multiply them for ongoing benefit to her family.